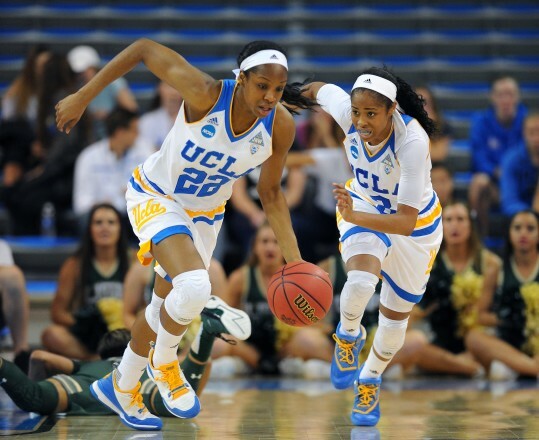 UCLA's Kennedy Burke (left) and Jordin Canada play in a second-round college basketball game against South Florida in the NCAA Tournament in March. The university, among many other schools across the country, uses a tactic known as roster management to find ways to comply with Title IX. Many college sports programs around the country use a tactic known as roster management to find ways to comply with Title IX, the gender equity law. My new story focuses specifically on one school, UCLA, and found that it uses phantom players and counts male practice players as females (something the Department of Education tells schools that they have to do), plumping up its numbers and raising questions about whether it truly complies with the law. This is a story that could be done on other campuses, too. So if you’re a student at the school newspaper or a working journalist who covers a university, here’s a tip sheet on how to turn around a story like this quickly. First, some background reading: Give this New York Times story on roster management from 2011 a close read. It’ll give you an idea of all the different ways schools inflate their numbers. Find out what “prong” your university uses to comply with Title IX. Every university that receives federal funding in the U.S., which is pretty much every university, needs to comply with Title IX. When it comes to sports, there are three ways schools can show they’re in compliance. These ways often are referred to as Prong 1, Prong 2 and Prong 3. A school has to pick just one prong to prove that it’s complying. To find out what prong your school uses, ask what test or what prong the school uses to comply with Title IX sports participation. I got a direct answer from staff members within the communication departments at UCLA and The University of Alabama. This guide only works for Prong 1. So if your school uses the other two prongs, sorry, but we’re not going to be much help. But most schools with a long-standing sports program use Prong 1, called substantial proportionality. It means that a school’s athletic body should reflect its general student body makeup of men and women. It doesn’t have to be exactly proportional, just substantial. Get the Equity in Athletics Disclosure Act report for your school and look for red flags. On its face, does the proportion of male and female athletes in the EADA report match the proportion of male and female students in the undergraduate population? If no, then you could have a story. In this example, you can see that women make up 56 percent of the student body at UCLA (in the top yellow box). And according to these numbers, they make up about that same percentage of the athletes, too (bottom yellow box). Schools can get some wiggle room. The Office for Civil Rights does not have an exact percentage for what that wiggle room is, but in a clarification letter, the office gave an example that if the number of women a school needs to add in order to be in exact proportion is more than the average size of a team, then it doesn’t comply. If its percentages look right, is there a women’s team that stands out as larger than the rest, and is it big enough to balance out, say, a large football team? For instance, I noticed UCLA’s women’s rowing team was almost twice as large as the average Division I rowing team. If you do see a large women’s team that sticks out, proceed to the next step. Compare the EADA report with the school’s online roster. And make sure it’s for the same year. One simple way to see if the rosters might be out of whack is to look for differences between the rosters on the EADA report and what the school puts on its website. Again, the UCLA example: The university reported 127 athletes on the women’s rowing team in the EADA report, but only 45 online. There’s an important detail to double check. The EADA reports are usually a year behind. So make sure you’re comparing rosters for the same year. If those two numbers are way different, it’s worth looking into. The EADA report number rarely will match the online roster exactly. And there are legit reasons for this. Players drop off the team midyear, they get injured and can’t compete the rest of the year, or a player is redshirted and only participates in practices. But if you see a big difference, such as 127 versus 45, go to the next step. Request the official official document from the school. Submit a Freedom of Information Act request or a state public records act request to the university’s records department asking to see the “National Collegiate Athletic Association squad list” for the academic year you’re looking into. This document will include names of everyone on the team, names of people who tried out for the team to check for eligibility, and names of medically retired or redshirted participants. If you’re lucky, you also may get the “change-in-status” column, which would show you whether or not someone dropped off the team or was cut from the team. Make sure there are names. Fight back if there aren’t. If you get back a document with names from all the teams, you have enough to work with. If you get back a document that redacts the athletes’ names (as we did with UCLA), challenge the school’s response by telling it that athletic participation is public record. UCLA argued that releasing the names would violate personal privacy laws under the federal Family Educational Rights and Privacy Act and California Government Code Section 6254(c). But we argued that the athletes’ names already are posted online and broadcasted on TV; eventually, the school released the names. Make a note of everyone who is on the NCAA squad list but not on the online roster. For me, that number was 85. Do a quick gut check, though. Everyone who is on the online roster should be on the squad list, but not necessarily the other way around. So if you are finding that nearly everyone on the squad list isn’t on the online roster, you probably have a mismatched squad list and roster. Email and call everyone you can. Now you have to figure out whether these people who are on the squad list but not the public roster were really on the team. A lot of students are scared to talk. Or they don’t reply to their campus emails. Try calling their parents, who are more likely to have their contact information on public record databases, such as Nexis. Explain that their daughter’s name is on a list, and you’re just wondering why. Split up the responses you get into four categories. On the team and went to practices. On the team at some point but stopped midyear. Tried out for the team. Did not try out for team (only went to an information session, or put her name on some kind of interested list). Always check to make sure you have the right person. If an athlete says she has no idea why her name is on a list because she was never interested in that sport, you probably have the wrong person. Usually, her name shows up because she tried out or signed up on a list to show her interest in trying out. Keep a final tally of those who should not be counted. Students who are medically retired (but on the team), redshirted for eligibility, or were on the team for part of the year should be counted for EADA purposes. Students who were not on the team (never went to a practice) the year you’re looking at should not be counted. Calculate how large of a discrepancy there is. Let’s say you discover that the school is counting 50 students who were never on the team that year. That’s a big number. But is it substantial? Compare the new percentages of male and female athletes. 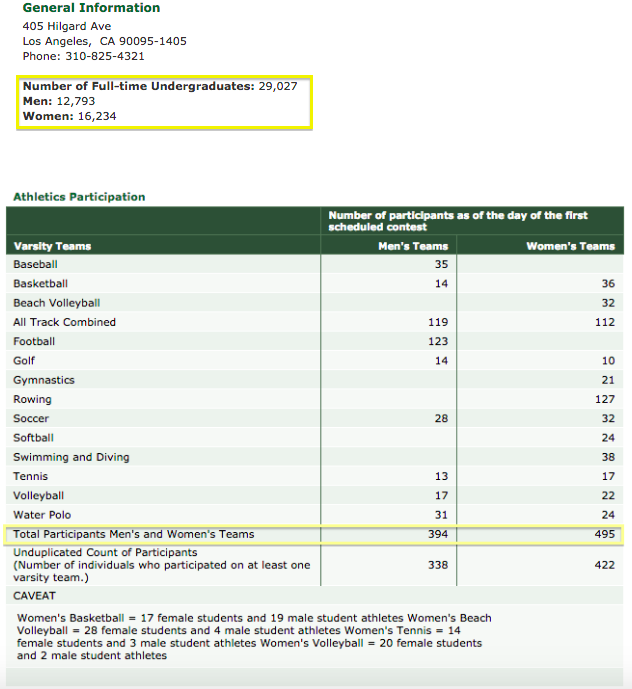 How many athletes would they need to add to match the exact percentage of women they have in the general student body? If that number is bigger than the average size of a women’s team for the school, it’s a big enough discrepancy. That means the school could add another team, or a few teams, and give women more opportunities to play in a sport. Let us know what you found. If you’ve followed these steps and written a story about your school’s compliance with Title IX, we want to help you spread the word. Tweet us a link (we’re @reveal), or drop a note to Byard Duncan, our community manager: bduncan@cironline.org. Rachel de Leon can be reached at rdeleon@revealnews.org. Follow her on Twitter: @rachelndeleon. On the team and went to practices. On the team at some point but stopped midyear. Tried out for the team. Did not try out for team (only went to an information session, or put her name on some kind of interested list). Always check to make sure you have the right person.